County health officials Wednesday reported the death of a San Diego County man due to flu complications, bringing this flu season’s death toll in the region to seven. The 73-year-old man died due to influenza A complications on Dec. 16, according to the county’s Health and Human Services Agency. The man’s vaccination status and medical history are still being investigated. The other six county residents who have died this season had additional medical conditions and either weren’t vaccinated or their vaccination status was unknown. At this time last year, 11 county residents had died due to flu complications. Last flu season was the county’s worst in nearly 20 years of collecting data, with 342 residents succumbing to flu complications. Residents over the age of 65 with underlying medical conditions accounted for much of that death toll, according to the county. According to the county’s weekly flu report for Dec. 16-22, lab-confirmed flu cases rose for the fourth consecutive week, from 290 to 410. That jump is a far cry, however, from the same week last flu season when reported cases spiked to 2,332. To date, 1,339 flu cases have been reported and lab-confirmed this flu season. “While we’re seeing fewer flu cases this season, everyone 6 months and older should get vaccinated since the flu season could last through April and even May,” Wooten said. In addition to residents 6 months and older, county health officials and the Centers for Disease Control and Prevention strongly advise the annual flu vaccination for people with a heightened risk of serious flu complications, like pregnant women, people older than 65 and people with chronic conditions like asthma and diabetes. County residents can get vaccinated at doctors’ offices, retail pharmacies, community clinics and the county’s public health centers. 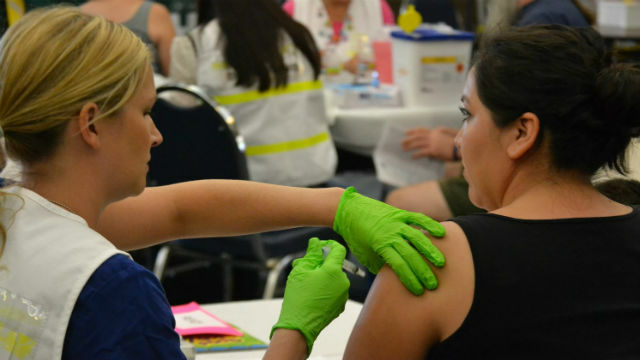 Residents can also call 2-1-1 or visit the county’s immunization program website, sdiz.com, for a list of county locations administering free vaccines.